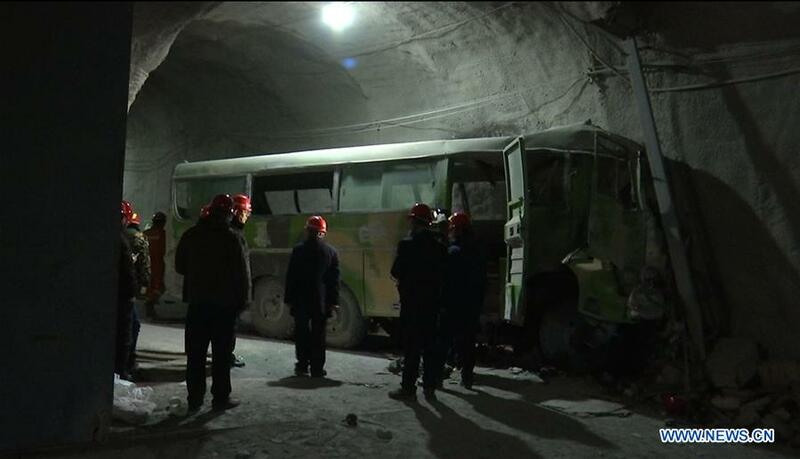 An unqualified shuttle bus and severe overload caused a 22-death accident in a mine in Xilingol league, Inner Mongolia autonomous region, local authorities said on Tuesday. Zhang Yuguo, a member of the local investigation team, said Yinman Mining Co bought the bus through an illegal channel online. According to Zhang, the bus was not subject to any safety checks. Additionally the bus, with a rated capacity of 30 passengers, should only be used for ground transport. Instead, it carried 50 miners to an underground mine shaft and crashed into the side of the tunnel after a brake failure. The company also violated regulations in the design of safety facilities and in using the ramp to transport personnel, Zhang said. The official added the company seriously violated the requirements of production suspension and resumption of work. The company had reported to government departments it would not stop production during the Spring Festival holiday which began on Feb 4, but in fact it stopped production on Jan 15 and resumed work without authorization on Feb 13. Zhang also noted local inspection departments lack targeted supervision on enterprises' safety problems or the suspension and resumption of work during a special period. The autonomous region has sent 12 teams to its 12 cities to inspect all enterprises with ramp shaft and check enterprises that are about to resume production.